Findspot: Found at Athens, Acropolis, found east of Parthenon in 1882. (Akr. 609 was found near Erechtheion in 1886 or 1887). 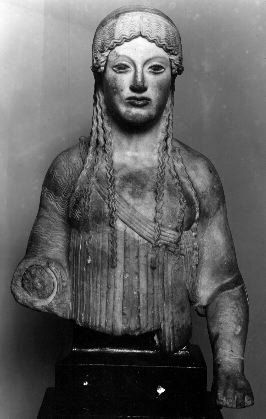 Dedicatory statue of maiden, late example of kore type. Frontal pose, characteristic archaic gesture of skirt pulled to side, here with left hand. Left leg forward. Right arm originally extended in offering. Coiffure relatively simple with emphatic central part, three long tresses fall forward over each shoulder. Ionic style of dress with himation over thin chiton, but again simply rendered. Detailed decoration added in paint, as the frieze of racing chariots on the chiton. Generally considered to be part of the debris from the Persian destruction of 480. Stance and mannerism of skirt pulled hard against legs are characteristically archaic, but concern with underlying structure rather than surface pattern pushes statue into period of Early Classical development. Often compared with Blond Boy (Athens, Acropolis 689). Perhaps by same sculptor. Broken in large fragments with few chips as from single fall, but where preserved surface is fresh and shows little wear. This fragment preserves upper body including head and most of left arm, broken at waist. Another fragment, Athens, Acropolis 609, preserves lower legs and plinth, set into inscribed base. Traces of painted frieze depicting chariot race decorate chiton still visible. On the base, a column capital, in stoichedon: EUTHUDIKOS hO THALIARCHO ANETHEKEN, Euthydikos son of Thaliarchos dedicated it. A second dedication by Euthydikos is also known. Raubitscheck suggested it may have been set up after 480 BC to replace this one, probably destroyed by the Persians.